A common scene in the African savanna is a small, yellow-billed oxpecker perching on the back of a zebra. They are collaborating for mutual benefit. The oxpecker feeds off ticks and parasites that live on the zebra’s skin and—when it senses danger—it flies up near the zebra’s head and sounds a distinct warning. The oxpecker gets a free ride and a constant source of food, while the zebra gets constant pest control and a head start on predators. Each benefits from the collaboration. 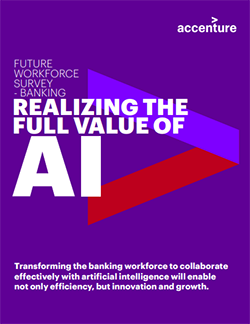 Nearly 80 percent of the senior banking executives interviewed for our recent Future Workforce Survey plan to use AI to automate tasks to a large or very large extent in the next three years. In banking, we see a similar synergistic relationship emerging between bank employees and artificial intelligence (AI). Our analysis¹ indicates that between 2018 and 2022, banks that commit fully to AI and human-machine collaboration could boost their revenue by an average of 34 percent and, critically, increase employment levels by 14 percent. There are many things that machines do very well and also things that humans do very well, but we are increasingly recognizing that in many activities, man + machine is the most powerful combination. We are also at the beginning of a material investment wave. Nearly 80 percent of the senior banking executives interviewed for our recent Future Workforce Survey plan to use AI to automate tasks to a large or very large extent in the next three years. Findings from our 2018 North America Banking Operations Survey show that 22 percent of banks are already using AI, machine learning, and natural language processing—and another 55 percent intend to do so within the next year. Following industries like manufacturing, banks have already embraced the power of AI to automate processes and lower costs. Yet to win against digital startups and non-banks, incumbents will need to move beyond automation—applying in more nuanced ways AI’s ability to sense, communicate, interpret and learn within a broad enterprise structure that elevates human capabilities and unlocks new value. It’s what Accenture calls “applied intelligence,” combining technology and human ingenuity across all parts of a bank’s core business to solve complex challenges, delight customers, break into new markets and generate entirely fresh revenue streams. Rather than working in isolation, humans and machines are going to be working together just like the oxpecker and the zebra to produce a combined effect greater than the sum of their separate outcomes. Reimagine work to better understand how machines and people can collaborate. Pivot the workforce to areas that create new forms of value. Ramp up “new skilling” to enable people to work with intelligent machines. While they see the potential, most banks have yet to take a disciplined enterprise-wide approach to AI. A significant barrier is banking executives’ anticipation of resistance from employees. Most cite a growing skills gap as the leading factor influencing their workforce strategy, and they believe that, on average, only 26 percent of their workforce is ready to work with intelligent technologies. We think this pessimism is misplaced, and that they are in for a pleasant surprise. In part two of this topic, I’ll discuss what bank employees told us about their views on human-machine collaboration. Until then, I invite you to read the entire report to learn more. Want to change your bank’s culture? Change with the business.